If you’re a foodie, you can’t go wrong with a trip to St Lucia. Go to St Lucia for your holidays, and you will enjoy some of the world’s best beach spots, where you can relax and unwind while sipping iconic Caribbean cocktails and swimming in the warm surf. However, one of the things people occasionally overlook when planning a trip to this paradise region is the great diversity of Caribbean cuisine. If you are planning your escape to this magical region and are wondering what foods to try, here are some that would be criminal to miss out on. It’s the obvious answer to the question, “What food do you have to try on your trip to St Lucia?” Definitely seafood. Whether it’s swimming or in a shell, St Lucia is replete with delicious oceanic staples, such as lobster, the tender whitefish, flying fish, and larger ones like grouper, which make for excellent steaks. 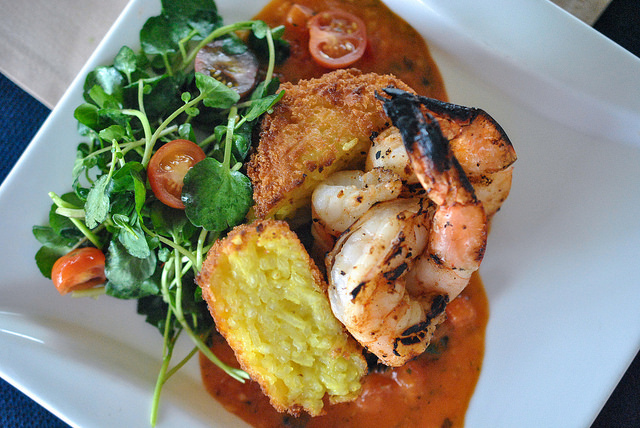 St Lucian food is a combination of Creole with French and West Indian influence. Callaloo is a great representation of this type of food. This dish has its roots in Africa, and its main ingredients are the leaves for which it’s named. Often consisting of other greens, including taro leaf and water spinach, this vegetable dish is reduced into a thick stew, and features peppers, coconut milk, okra, and can also include a variety of meats. 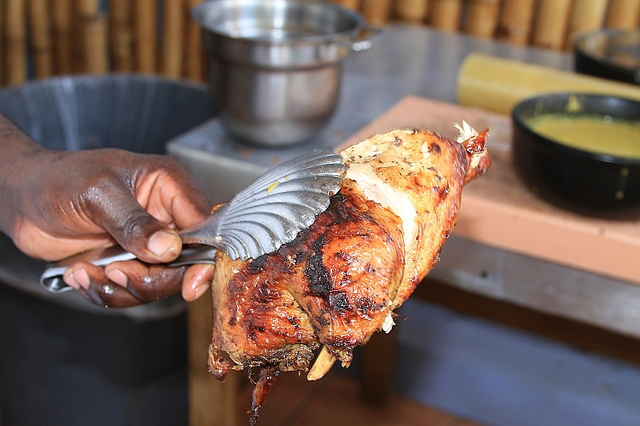 Of all the places in the Caribbean, Jerk is done best in Jamaica, the home of this famous style of cooking. Jerk is essentially a spicy dry, or wet rub, applied to meats—often chicken—which absorb the flavors of the spices and are grilled over an open flame. Perfect for sorting out your hunger pangs after a day in the surf. If you’re looking for a great snack while you’re in Trinidad, then be sure to try a Saheena. These are made from a long roll-up of callaloo and split-pea butter, which are then sliced and deep-fried. Served with a smattering of mango chutney and tamarind, these tasty snacks are ones you won’t soon forget. Conch, also known as lambi, is eaten raw in salads, or cooked, as in burgers, chowders, fritters, and gumbos. All parts of the conch meat are edible. The most common way to find it is in fritter form, and the meat tastes similar to clams. Pepperpot is a dish that is served and made famous in Guyana. It is the country’s national dish, and essentially a type of meat stew that is traditionally served at Christmas. The dish is made from a mix of meats, including beef, pork, and mutton, which are then stewed with a number of tasty spices, such as cinnamon, cassareep (made from the cassava root), and other local ingredients like hot peppers. Whatever part of the Caribbean you happen to be heading to, you’ll quickly discover a world of great and unusual tastes that you will be craving long after your beach holidays are over. Images by Larry Hoffman and Terence Chang used under the Creative Commons license.